Our "Fafnir" body armour is something really special. Metal plates have been riveted on a backing of padded suede. Especially the comfort of the wearer and the feasibility of putting on a complete suit of armour in a few minutes were our goals. Because of this there is no need to wear a gambeson or a similar garment. You have the choice between three different adjustments which you can make yourselves. The different parts of the armour are connected by leather straps. The three different sizes are achieved by pulling these straps through eyelets. 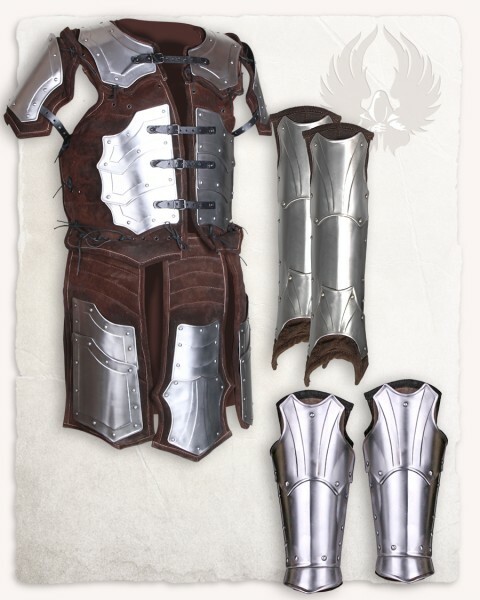 Additionally, you can omit some parts of the armour, eg. the shoulder parts or the thigh protectors.